2 Extensive inventory! If you don't see what you're looking for, please contact an H&M Wagner & Sons Foodservice Representative. 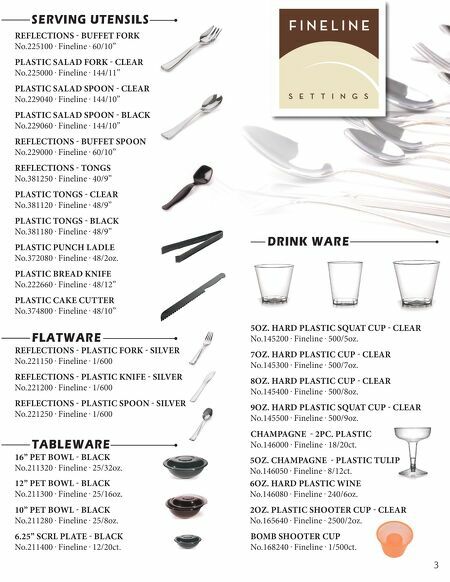 800-492-4571 or 410-766-1150 HMWagner.com Convenient ways to order! → Your H&M Sales Representative! → Phone! Call 800-492-4571 or 410-766-1150 → Shop in our Showroom! This allows you to shop stocked products, closeout items and specials at a competitive price! → Order Online! Connect with us! 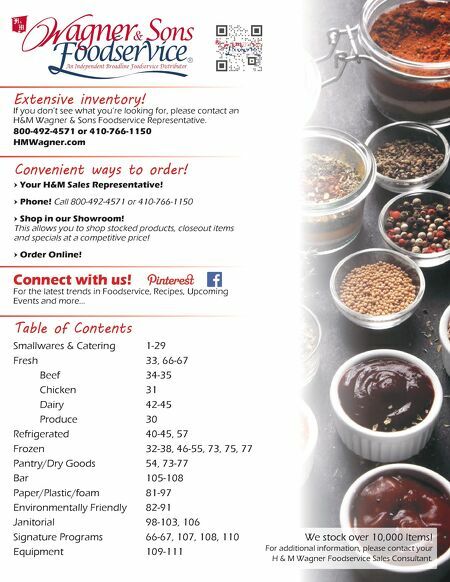 For the latest trends in Foodservice, Recipes, Upcoming Events and more... Table of Contents Smallwares & Catering 1-29 Fresh 33, 66-67 Beef 34-35 Chicken 31 Dairy 42-45 Produce 30 Refrigerated 40-45, 57 Frozen 32-38, 46-55, 73, 75, 77 Pantry/Dry Goods 54, 73-77 Bar 105-108 Paper/Plastic/foam 81-97 Environmentally Friendly 82-91 Janitorial 98-103, 106 Signature Programs 66-67, 107, 108, 110 Equipment 109-111 We stock over 10,000 Items! For additional information, please contact your H & M Wagner Foodservice Sales Consultant.